Osiris (/oʊˈsaɪrɪs/, from Egyptian wsjr, Coptic ⲟⲩⲥⲓⲣⲉ) is the god of the afterlife, the underworld, and rebirth in ancient Egyptian religion. He was classically depicted as a green-skinned deity with a pharaoh's beard, partially mummy-wrapped at the legs, wearing a distinctive atef crown, and holding a symbolic crook and flail. (He was one of the first to be associated with the mummy wrap. When his brother, Set, cut him up into pieces after killing him, Isis, his wife, found all the pieces and wrapped his body up.) Osiris was at times considered the eldest son of the god Geb and the sky goddess Nut, as well as being brother and husband of Isis, with Horus being considered his posthumously begotten son. He was also associated with the epithet Khenti-Amentiu, meaning "Foremost of the Westerners", a reference to his kingship in the land of the dead. As ruler of the dead, Osiris was also sometimes called "king of the living": ancient Egyptians considered the blessed dead "the living ones". Through syncretism with Iah, he is also the god of the Moon. Osiris, lord of the dead and rebirth. His green skin symbolizes rebirth. Osiris was considered the brother of Isis, Set, Nephthys, and Horus the Elder, and father of Horus the Younger. The first evidence of the worship of Osiris was found in the middle of the Fifth dynasty of Egypt (25th century BC), although it is likely that he was worshiped much earlier; the Khenti-Amentiu epithet dates to at least the first dynasty, and was also used as a pharaonic title. Most information available on the myths of Osiris is derived from allusions contained in the Pyramid Texts at the end of the Fifth Dynasty, later New Kingdom source documents such as the Shabaka Stone and the Contending of Horus and Seth, and much later, in narrative style from the writings of Greek authors including Plutarch and Diodorus Siculus. Osiris was the judge of the dead and the underworld agency that granted all life, including sprouting vegetation and the fertile flooding of the Nile River. He was described as "He Who is Permanently Benign and Youthful" and the "Lord of Silence". The Kings of Egypt were associated with Osiris in death – as Osiris rose from the dead so would they in union with him, and inherit eternal life through a process of imitative magic. Through the hope of new life after death, Osiris began to be associated with the cycles observed in nature, in particular vegetation and the annual flooding of the Nile, through his links with the heliacal rising of Orion and Sirius at the start of the new year. Osiris was widely worshipped until the decline of ancient Egyptian religion during the rise of Christianity in the Roman Empire. Osiris is a Latin transliteration of the Ancient Greek Ὄσιρις IPA: [ó.siː.ris], which in turn is the Greek adaptation of the original name in the Egyptian language. In Egyptian hieroglyphs the name appears as wsjr, which some Egyptologists instead choose to transliterate ꜣsjr or jsjrj. Since hieroglyphic writing lacks vowels, Egyptologists have vocalized the name in various ways, such as Asar, Ausar, Ausir, Wesir, Usir, or Usire. John Gwyn Griffiths (1980), "bearing in mind Erman's emphasis on the fact that the name must begin with an [sic] w", proposes a derivation from wsr with an original meaning of "The Mighty One". Moreover, one of the oldest attestations of the god Osiris appears in the mastaba of the deceased Netjer-wser (from nṯr-wsr "Powerful God"). Kurt Sethe (1930) proposes a compound st-jrt, meaning "seat of the eye", in a hypothetical earlier form *wst-jrt; this is rejected by Griffiths on phonetic grounds. David Lorton (1985) takes up this same compound but explains st-jrt as signifying "product, something made", Osiris representing the product of the ritual mummification process. Wolfhart Westendorf (1987) proposes an etymology from wꜣst-jrt "she who bears the eye". Mark J. Smith (2017) makes no definitive proposals but asserts that the second element must be a form of jrj ("to do, make") (rather than jrt ("eye")). Yoshi Muchiki (1990) reexamines Erman's evidence that the throne hieroglyph in the word is to be read ws and finds it unconvincing, suggesting instead that the name should be read ꜣsjr on the basis of Aramaic, Phoenician, and Old South Arabian transcriptions, readings of the throne sign in other words, and comparison with ꜣst ("Isis"). James P. Allen (2000) reads the word as jsjrt but revises the reading (2013) to jsjrj and derives it from js-jrj, meaning "engendering (male) principle". 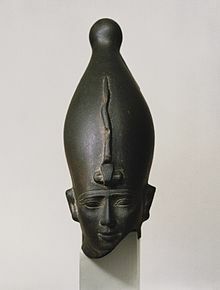 Osiris is represented in his most developed form of iconography wearing the Atef crown, which is similar to the White crown of Upper Egypt, but with the addition of two curling ostrich feathers at each side. He also carries the crook and flail. The crook is thought to represent Osiris as a shepherd god. The symbolism of the flail is more uncertain with shepherds whip, fly-whisk, or association with the god Andjety of the ninth nome of Lower Egypt proposed. Osiris is the mythological father of the god Horus, whose conception is described in the Osiris myth (a central myth in ancient Egyptian belief). The myth describes Osiris as having been killed by his brother, Set, who wanted Osiris' throne. His wife, Isis finds the body of Osiris and hides it in the reeds where it is found and dismembered by Set. Isis retrieves and joins the fragmented pieces of Osiris, then briefly brings Osiris back to life by use of magic. This spell gives her time to become pregnant by Osiris before he again dies. Isis later gives birth to Horus. As such, since Horus was born after Osiris' resurrection, Horus became thought of as a representation of new beginnings and the vanquisher of the usurper Set. Ptah-Seker (who resulted from the identification of Creator god Ptah with Seker) thus gradually became identified with Osiris, the two becoming Ptah-Seker-Osiris. As the sun was thought to spend the night in the underworld, and was subsequently "reborn" every morning, Ptah-Seker-Osiris was identified as king of the underworld, god of the afterlife, life, death, and regeneration. Osiris' soul, or rather his Ba, was occasionally worshipped in its own right, almost as if it were a distinct god, especially in the Delta city of Mendes. This aspect of Osiris was referred to as Banebdjedet, which is grammatically feminine (also spelt "Banebded" or "Banebdjed"), literally "the ba of the lord of the djed, which roughly means The soul of the lord of the pillar of continuity. The djed, a type of pillar, was usually understood as the backbone of Osiris. 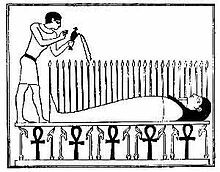 The Nile supplying water, and Osiris (strongly connected to the vegetable regeneration) who died only to be resurrected, represented continuity and stability. As Banebdjed, Osiris was given epithets such as Lord of the Sky and Life of the (sun god) Ra, since Ra, when he had become identified with Atum, was considered Osiris' ancestor, from whom his regal authority is inherited. Ba does not mean "soul" in the western sense, and has to do with power, reputation, force of character, especially in the case of a god. Plutarch recounts one version of the Osiris myth in which Set (Osiris' brother), along with the Queen of Ethiopia, conspired with 72 accomplices to plot the assassination of Osiris. Set fooled Osiris into getting into a box, which Set then shut, sealed with lead, and threw into the Nile. Osiris' wife, Isis, searched for his remains until she finally found him embedded in a tamarisk tree trunk, which was holding up the roof of a palace in Byblos on the Phoenician coast. She managed to remove the coffin and retrieve her husband's body. In one version of the myth, Isis used a spell to briefly revive Osiris so he could impregnate her. After embalming and burying Osiris, Isis conceived and gave birth to their son, Horus. Thereafter Osiris lived on as the god of the underworld. Because of his death and resurrection, Osiris was associated with the flooding and retreating of the Nile and thus with the yearly growth and death of crops along the Nile valley. Annual ceremonies were performed in honor of Osiris in various places across Egypt. These ceremonies were fertility rites which symbolised the resurrection of Osiris. E.A. Wallis Budge stated "Osiris is closely connected with the germination of wheat; the grain which is put into the ground is the dead Osiris, and the grain which has germinated is the Osiris who has once again renewed his life." Plutarch and others have noted that the sacrifices to Osiris were "gloomy, solemn, and mournful..." (Isis and Osiris, 69) and that the great mystery festival, celebrated in two phases, began at Abydos commemorating the death of the god, on the same day that grain was planted in the ground (Isis and Osiris, 13). The annual festival involved the construction of "Osiris Beds" formed in shape of Osiris, filled with soil and sown with seed. Much of the extant information about the rites of Osiris can be found on the Ikhernofret Stela at Abydos erected in the 12th Dynasty by Ikhernofret, possibly a priest of Osiris or other official (the titles of Ikhernofret are described in his stela from Abydos) during the reign of Senwosret III (Pharaoh Sesostris, about 1875 BC). The ritual reenactment of Osiris's funeral rites were held in the last month of the inundation (the annual Nile flood), coinciding with Spring, and held at Abydos which was the traditional place where the body of Osiris drifted ashore after having been drowned in the Nile. A rare sample of Egyptian terra cotta sculpture which may depict Isis mourning Osiris. 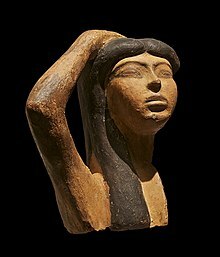 The sculpture portrays a woman raising her right arm over her head, a typical gesture of mourning. Musée du Louvre, Paris. Contrasting with the public "theatrical" ceremonies sourced from the I-Kher-Nefert stele (from the Middle Kingdom), more esoteric ceremonies were performed inside the temples by priests witnessed only by chosen initiates. 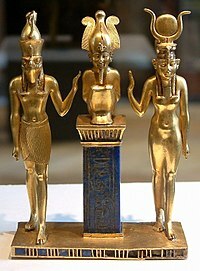 Plutarch mentions that (for much later period) two days after the beginning of the festival "the priests bring forth a sacred chest containing a small golden coffer, into which they pour some potable water...and a great shout arises from the company for joy that Osiris is found (or resurrected). Then they knead some fertile soil with the water...and fashion therefrom a crescent-shaped figure, which they cloth and adorn, this indicating that they regard these gods as the substance of Earth and Water." (Isis and Osiris, 39). Yet his accounts were still obscure, for he also wrote, "I pass over the cutting of the wood" – opting not to describe it, since he considered it as a most sacred ritual (Ibid. 21). In the Osirian temple at Denderah, an inscription (translated by Budge, Chapter XV, Osiris and the Egyptian Resurrection) describes in detail the making of wheat paste models of each dismembered piece of Osiris to be sent out to the town where each piece is discovered by Isis. At the temple of Mendes, figures of Osiris were made from wheat and paste placed in a trough on the day of the murder, then water was added for several days, until finally the mixture was kneaded into a mold of Osiris and taken to the temple to be buried (the sacred grain for these cakes were grown only in the temple fields). Molds were made from the wood of a red tree in the forms of the sixteen dismembered parts of Osiris, the cakes of "divine" bread were made from each mold, placed in a silver chest and set near the head of the god with the inward parts of Osiris as described in the Book of the Dead (XVII). The idea of divine justice being exercised after death for wrongdoing during life is first encountered during the Old Kingdom in a 6th dynasty tomb containing fragments of what would be described later as the Negative Confessions performed in front of the 42 Assessors of Ma'at. At death a person faced judgment by a tribunal of forty-two divine judges. If they led a life in conformance with the precepts of the goddess Ma'at, who represented truth and right living, the person was welcomed into the kingdom of Osiris. If found guilty, the person was thrown to the soul-eating demon Ammit and did not share in eternal life. The person who is taken by the devourer is subject first to terrifying punishment and then annihilated. These depictions of punishment may have influenced medieval perceptions of the inferno in hell via early Christian and Coptic texts. Purification for those who are considered justified may be found in the descriptions of "Flame Island", where they experience the triumph over evil and rebirth. For the damned, complete destruction into a state of non-being awaits, but there is no suggestion of eternal torture. During the reign of Seti I, Osiris was also invoked in royal decrees to pursue the living when wrongdoing was observed but kept secret and not reported. The early Ptolemaic kings promoted a new god, Serapis, who combined traits of Osiris with those of various Greek gods and was portrayed in a Hellenistic form. Serapis was often treated as the consort of Isis and became the patron deity of the Ptolemies' capital, Alexandria. Serapis's origins are not known. Some ancient authors claim the cult of Serapis was established at Alexandria by Alexander the Great himself, but most who discuss the subject of Serapis's origins give a story similar to that by Plutarch. Writing about 400 years after the fact, Plutarch claimed that Ptolemy I established the cult after dreaming of a colossal statue at Sinope in Anatolia. His councillors identified as a statue of the Greek god Pluto and said that the Egyptian name for Pluto was Serapis. This name may have been a Hellenization of "Osiris-Apis". Osiris-Apis was a patron deity of the Memphite Necropolis and the father of the Apis bull who was worshipped there, and texts from Ptolemaic times treat "Serapis" as the Greek translation of "Osiris-Apis". But little of the early evidence for Serapis's cult comes from Memphis, and much of it comes from the Mediterranean world with no reference to an Egyptian origin for Serapis, so Mark Smith expresses doubt that Serapis originated as a Greek form of Osiris-Apis's name and leaves open the possibility that Serapis originated outside Egypt. The cult of Isis and Osiris continued at Philae until at least the 450s CE, long after the imperial decrees of the late 4th century that ordered the closing of temples to "pagan" gods. Philae was the last major ancient Egyptian temple to be closed. This section should include a summary of, or be summarized in, another article. See Wikipedia:Summary style for information on how to incorporate it into this article's main text, or the main text of another article. ^ "Coptic Dictionary Online". corpling.uis.georgetown.edu. Retrieved 2017-03-17. ^ Allen, James P. (2010). Middle Egyptian: An Introduction to the Language and Culture of Hieroglyphs. Cambridge University Press. ISBN 9781139486354. ^ "Egyptian Mythology - Osiris Cult". www.touregypt.net (in Russian). Retrieved 2018-10-26. ^ a b Wilkinson, Richard H. (2003). The Complete Gods and Goddesses of Ancient Egypt. London: Thames & Hudson. p. 105. ISBN 978-0-500-05120-7. ^ Quirke, S.; Spencer, A. J. (1992). The British Museum Book of Ancient Egypt. London: The British Museum Press. ^ "The Historical Library of Diodorus Siculus", vol. 1, translated by G. Booth, 1814. ^ "Man, Myth and Magic", Osiris, vol. 5, pp. 2087–2088, S.G.F. Brandon, BPC Publishing, 1971. ^ "Catholic Encyclopedia: Theodosius I". Newadvent.org. 1912-07-01. Retrieved 2012-05-01. ^ a b c Smith, Mark (2017). Following Osiris: Perspectives on the Osirian Afterlife from Four Millennia. pp. 124–125. ^ a b Griffiths, John Gwyn (1980). The Origins of Osiris and His Cult. pp. 124–125. ^ Westendorf, Wolfhart (1987). "Zur Etymologie des Namens Osiris: *wꜣs.t-jr.t "die das Auge trägt"". Form und Mass: Beiträge zur Literatur, Sprache und Kunst des Alten Ägypten: Festschrift für Gerhard Fecht Zum 65. Geburtstag Am 6. Februar 1987 (in German): 456–461. ^ Muchiki, Yoshi (1990). "On the transliteration of the name Osiris". The Journal of Egyptian Archaeology. 76: 191–194. ^ Allen, James P. (2010-04-15). Middle Egyptian: An Introduction to the Language and Culture of Hieroglyphs. Cambridge University Press. ISBN 9781139486354. ^ Allen, James P. (2013). "The Name of Osiris (and Isis)". Lingua Aegyptia. 21: 9–14. ^ Plutarch's Moralia, On Isis and Osiris, ch. 12. 1874. Retrieved 2012-05-01. ^ "Osiris", Man, Myth & Magic, S.G.F Brandon, Vol5 P2088, BPC Publishing. ^ "Osiris Bed, Burton photograph p2024, The Griffith Institute". ^ a b "The passion plays of osiris". ancientworlds.net. Archived from the original on 2007-06-26. ^ "Letter: Hell in the ancient world. Letter by Professor J. Gwyn Griffiths". The Independent. December 31, 1993. ^ Wilkinson (2003), pp. 127–128. ^ Smith (2017), pp. 390–394. Wikisource has the text of The New Student's Reference Work article "Osiris". Wikimedia Commons has media related to Osiris. Osiris—"Ancient Egypt on a Comparative Method"